Friends, the groundbreaking series and one of the most popular TV sitcoms of all time, is releasing its tenth and final season on DVD, including 18 episodes with never-before-seen footage and extensive bonus features, including a 45-minute gag reel! After 10 very successful years on the air, Friends finally went dark. It didn’t depart due to declining ratings, as it remained one of TV’s most popular shows. Instead, I guess all involved simply felt it was time to move on, and they were probably correct. While the show was still entertaining, it became more and more difficult to work in the same way as its characters got older. What started as a look at the lives of 20-somethings couldn’t function the same way when those same characters pushed 40. That meant that 10 years was more than enough Friends, and I’m glad it ended before it became too stale and tiresome. Aired during 2003-2004, I’ll offer brief discussions of all the Season 10 episodes, listed in their broadcast order. The synopses mostly come straight from the package’s liner notes. “Fine” is all about the performances. On one hand, Schwimmer elevates the Ross material with his goofy, over-the-top take on the character’s discomfort with the situation. Schwimmer never makes Ross seem realistic during those moments, but he’s darned funny. On the other hand, Ribisi offers another in a long line of the mannered and annoying performances that made him my least-favorite recurring actor on Friends. Boy, do I hope this is the last we see of him! Despite Ribisi’s presence and some sappiness toward the end, “Fine” is a winner. The Rachel/Joey bit is really the main emphasis of this show, since it advances the series’ arc. It works well enough on its own, though it’s never quite as funny as it probably should be. There’s something a little artificial and saccharine about it. The other two elements fly, though. Jennifer Coolidge offers a great guest performance as the self-centered former friend, while Schwimmer’s physical shtick in the tanning booth is genuinely hilarious. While a competent show, “Cake” is the first episode of Season Ten that leaves me a little cold. Perhaps it’s the emphasis on the cutesy baby Emma; even though we don’t see her until the show’s end, the program’s orientation toward her turns it flabby. There’s some funny material on display, and until the predictably cloying conclusion, it gets better as it progresses. Nonetheless, I see this one as an average episode. If the series wasn’t so close to its conclusion, I’d look forward to Mike’s departure. However, I know he’ll be around until the end, so I guess we’re stuck with him. Boy, when he gets called “Mr. No-Balls”, the writers hit the nail on the end; he’s another in an endless series of wussy male guest characters. Applegate’s Amy fares a little better, but she’s such a one-dimensional character that she gets old quickly. Both those plot lines make this a lackluster show. The One With Ross’s Grant (27:03): “Ross interviews with a Nobel Prize-winning scientist for a paleontology grant – but the doctor is Charlie’s ex-boyfriend (Greg Kinnear), who offers Ross the grant only if he breaks up with her. Phoebe sends Monica and Rachel screaming with her artistic creation of ‘Gladys’”. Despite a nice comedic performance from Kinnear, I feel dissatisfied with “Grant” because of the pathetic way it dispenses with Charlie. It’s absurd that Kinnear’s character would get away with his treatment of Ross, and the quickness with which Charlie dumps Ross is also ridiculous. We get some funny moments via Phoebe’s art and Joey’s Japanese TV commercial, but I still don’t think a lot of this show. The main plot follows predictable lines but ends up as amusing, largely due to the way Joey turns tables at the end. Unfortunately, we see more of Mike the Wuss in another story that focuses on the decision he and Phoebe make – and then retract – to give away the money designated for their wedding. The less I see of Mike the better. Some of the best Friends episodes revolve around Thanksgiving, but this one doesn’t live up to those. The parts when the two sides bicker amuse, but too many odd moments mar it. Shouldn’t Phoebe denounce baby beauty pageants, not Rachel? What adoption agency is open for business on Thanksgiving? Why isn’t Mike at Thanksgiving, anyway? I may hate him, but it makes no sense he wouldn’t be with Phoebe. As one with issues regarding the sharing of food, I could definitely relate – and enjoy – that Joey thread. As one without the greatest fashion sense – and no clue what women think looks good on a guy – I liked Ross’s plot as well. Inevitably, the adoption one turns rather sappy. Nonetheless, the show balances the mawkishness with enough wacky humor to work. Easily the worst episode of the final season, this one mixes basic exposition related to the house hunting with – yuck! – a clip show. More than a third of the program consists of snippets from old programs. Clip shows are the lowest form of sitcom life, and they make this one a stinker. Plenty of amusement appears in this episode, though I can’t help but think it could’ve been even better. Joey’s stint on Pyramid is predictable but funny. We get a typically entertaining look at the gang in the Eighties that lacks zest just because of a “been there, done that” feeling. The party’s best moment comes from some ingenious guest casting, but it loses energy quickly. I can’t stand these big, schmaltzy event episodes. At least the build-up to Phoebe’s wedding wasn’t as interminable as the approach to Monica and Chandler’s, so I’m happy about that. Heck, we barely heard from Wussy Mike for the last few shows. Nonetheless, the episode lacks much to make it entertaining, as it falls into predictable lines. Despite all the sappiness inspired by the Ross/Rachel romance, few parts of Friends were ever as entertaining as their bickering. Aniston and Schwimmer get to revisit those days one last time, and they make the most of them. Add to that the consistently amusing thread with Joey’s inability to speak French and this episode offers good laughs. Wonder of wonders – Mike does something to make me laugh! He’s still a wuss, but his choice of new name is amusing. The rest of the episode is more mundane. This one exists to move the series’ arc toward the end and doesn’t go much of anywhere else, though Joey’s attempts to sour Monica and Chandler on their new house are moderately entertaining. Time for more Wrap Up Material. A rather weepy show, the episode spikes in some comedy bits, but they aren’t terribly good. The penultimate program, this one exists to get us to the finale. The Last One (49:54): Before Rachel leaves for Paris, she and Ross engage in one more night of passion. Ross interprets this as a sign they should get back together, but Rachel just looks at it as a nice goodbye. Surrogate mother Erica goes into labor early, so the pair need to rush her to the hospital. Erica gives birth, which results in some surprises. The episode watches their reaction to newfound parenthood and their plans to move to the suburbs as well as the conclusion of the Ross/Rachel saga. As for Joey and Phoebe, they’re just along for the ride. Will the Finale go down as one of the series’ better episodes? No, but it seemed like a fairly satisfying finish. Final shows are tough to do. They need to tie up stories in a believable way and not seem phony or artificial. The Finale does that generally well. Admittedly, the sappiness becomes a little heavy during the final act, but one must expect that. Friends tended toward some sentimentality anyway, so there was no way it would go the cold Seinfeld route for its last hurrah. The emotion feels genuine, as the show doesn’t toss out weepiness just for its own sake. Actually, the Finale presents more laughs than I anticipated. It manages more than a few funny bits, some of which come from unexpected sources. I really thought the birthing sequence at the hospital would be terribly treacly, but it manages to present some amusing moments via Chandler’s reactions. Phoebe’s attempts to help Ross snare Rachel work nicely too, and Joey’s patented dopiness gets in some humor one last time. Friends provided a mostly endearing and amusing series over 10 seasons, and the Finale sends it out on a good note. While not a classic episode, it manages to deliver a reasonably rewarding conclusion. As does Season Ten as a whole. I wasn’t wild about Season Nine and feared that Season Ten would be equally lackluster. Happily, it managed to become more amusing and likable than I expected. It finishes off the series well. 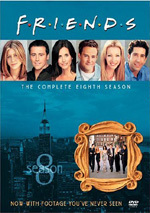 Friends: The Complete Tenth Season appears in an aspect ratio of approximately 1.33:1 on these single-sided, double-layered DVDs; due to those dimensions, the image has not been enhanced for 16X9 televisions. Folks who’ve seen prior Friends releases will find similar visuals for the final season. Sharpness was mostly positive. A few slightly soft shots occurred, but none of these were terribly intrusive. The shows could have been a little tighter, but I was satisfied with their definition. Only minor examples of shimmering, jagged edges and edge enhancement showed up, and source flaws were rare. The programs could be a little grainy, and I noticed a few small specks, but that was it. Colors worked well. The show presented nicely vivid and bright tones, and the DVD replicated them concisely. Blacks also seemed firm and rich than in the past, and shadows were reasonably distinctive and not too dense. The episodes didn’t dazzle, but they mostly looked fine. Just like previous sets, Friends offered a Dolby Digital 5.0 soundtrack. The scope and quality remained virtually identical to prior seasons. Dialogue dominated the episodes and remained oriented toward the front center. As always, music presented solid stereo presence over the front speakers, and the surrounds echoed the tunes moderately. The rear speakers added nice ambience in a few scenes like at the airport, in the park or at an arena, but otherwise the music was the main element from the back. As usual, audio quality was fine but not spectacular. The lines seemed concise and fairly natural, and they lacked edginess or problems with intelligibility. Effects seemed acceptably accurate, but they never taxed the track at all. At least no problems occurred with those elements, and the music came across as pretty bright and bouncy. The rock-oriented score sounded clean and distinct, and bass response was tight and fairly rich. Nothing special occurred, but the mix rendered the audio appropriately well. The package’s extras strongly resemble the elements from prior sets. Most show up on DVD Four, but we get a few bits on the others as well. As already noted, many of the episodes themselves include bonus footage. The amount of new material varies from show to show, and based on the running times, it appears that some of the shows include no extra footage. I don’t know Friends well enough to recognize most of the new shots, but I think it’s cool that we get the uncut programs. Three audio commentaries appear. Two appear on Disc Two via “The One with the Late Thanksgiving” and “The One Where the Stripper Cries”. The final commentary goes alongside DVD Three’s “The Last One”. We hear from executive producers Kevin S. Bright, Marta Kauffman, and David Crane. All the participants were recorded separately for these tracks, and the results were edited together. After plenty of prior commentaries with these three, fans will feel at home with this one. It works just like the others. The producers get into a mix of issues related to the specific shows as well as the overall series. We learn about production challenges, guest casting, script issues and story changes, logistical and technical topics, and finishing the series. As always, we get a fair amount of laughing and praise, usually from Kauffman, who also gets pretty weepy. There’s also a bit too much dead air during “The Last One”. Nonetheless, these commentaries remain generally informative and likable. Moving to DVD Four, FriendsFinal Thoughts presents a reflective featurette. In the 25-minute and 20-second piece, we hear from the three producers as well as actors David Schwimmer, Matthew Perry, Matt LeBlanc, Lisa Kudrow, Courtney Cox-Arquette, and Jennifer Aniston. They talk about the series’ roots, casting and the early days, the characters and their interactions, and the end of the show. As one might expect, we get a lot of praise and happy talk here. Nonetheless, it includes a reasonable amount of decent information and acts as a nice send-off for the series. Expect the usual material from the Gag Reels - and a lot more of it. We get reels for Seasons One, Two, Three, Four and Ten. Taken together, these run 41 minutes and 15 seconds, though about half of that comes from Season Ten alone. I rarely find these amusing. A few funny bits pop up here, and I like the occasional glimpses into the working processes on the show, but mostly these offer the standard goofiness and gags. 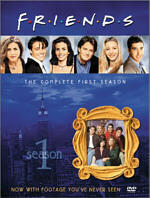 A staple of these DVDs, Friends of Friends runs 16 minutes and 59 seconds. It concentrates on the guest contributions of actors Aisha Tyler, Paul Rudd and Christina Applegate. They talk about their casting, their characters, and working on the show. As usual, there’s a lot of praise, but we get more than enough insight to make this a worthwhile featurette. Season Ten ended Friends, and that made these shows bittersweet. At least the series went out with a good run, especially after the disappointing Season Nine. The DVDs offer the usual good picture, average audio, and decent extras. This ends up as another nice collection that will fit well into your library of Friends DVDs.